U.S. authorities have not been able to find any trace of ill-gotten assets belonging to jailed drug lord Joaquin “El Chapo” Guzman, Mexico’s attorney general said this week. Before he was captured last year and extradited to the United States in January to stand trial, Guzman was one of the world’s most wanted drug traffickers and believed to have accumulated a fortune from reigning over his Sinaloa Cartel for many years. 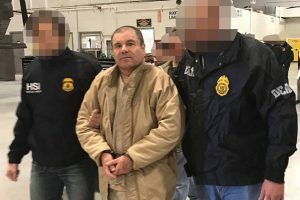 “As of today, U.S. authorities have not found not even one dollar of El Chapo’s assets,” Mexican Attorney General Raul Cervantes said in an interview with top local broadcaster Televisa, as reported by Reuters. Mexico has only found minor assets belonging to Guzman, Cervantes said. “His money hasn’t been found because he didn’t use the financial system,” he added. A federal indictment in the United States seeks the forfeiture of more than $14 billion of drug proceeds and illicit profits allegedly derived from the Sinaloa Cartel’s activities. Guzman, who broke out twice from prison in Mexico, was recaptured for the last time in January 2016. He was extradited to the United States to face charges there on Jan. 19, the eve of Donald Trump’s inauguration as U.S. president. In the same interview, Cervantes said that the relative upstart Jalisco New Generation Cartel is now Mexico’s largest criminal organization, eclipsing the country’s more familiar criminal syndicates like Sinaloa or the Zetas. On Tuesday, Mexican security forces arrested Damaso Lopez, who the United States once described as Guzman’s “right hand man” but had been locked in a bloody struggle for control of the Sinaloa Cartel against the sons of El Chapo.